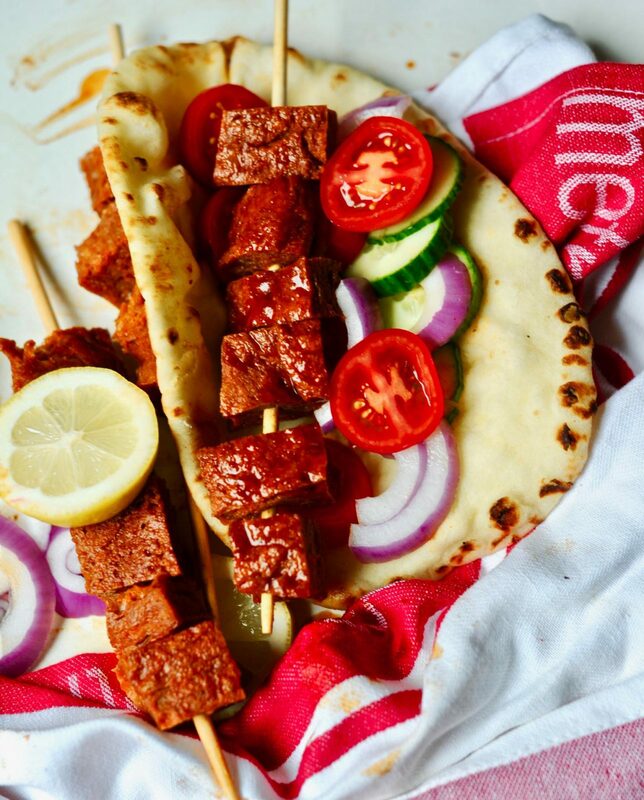 These Greek Vegan Gyros are perfect for a quick and easy family dinner. Kids just love them! 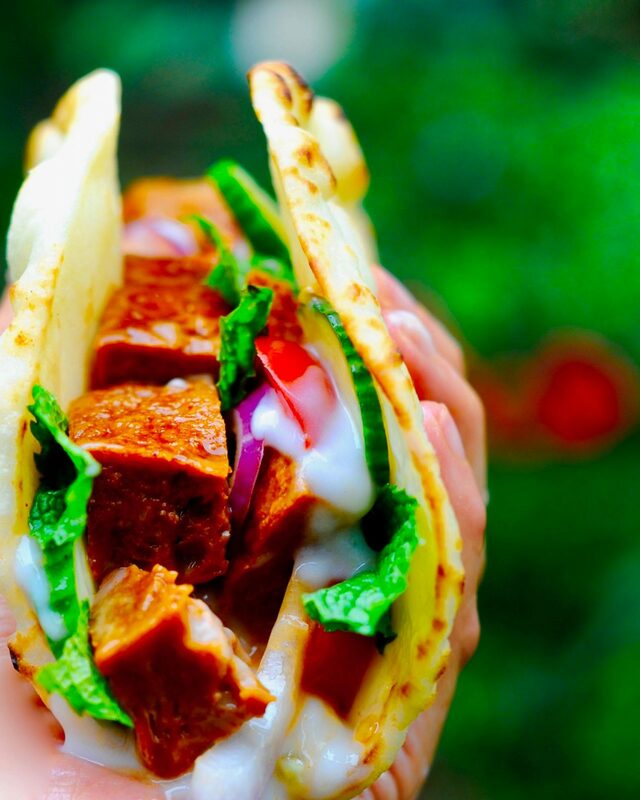 What is in vegan gyro?? 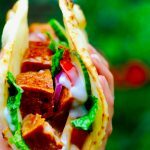 Layers of succulent charred seitan, juicy tomatoes, sliced pungent red onion, crisp lettuce drizzled with cooling garlicky tzatziki and wrapped up in a yeasted flat bread. Much like an anthology (I nailed this segue!) this wrap sings with the combined flavors and textures of each ingredient. I make vegan gyros on days when I need an emotional boost and a quick inner trip home to Greece. 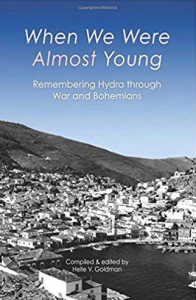 I am one of many contributors to this new Anthology When We Were Almost Young; Remembering Hydra through War and Bohemians, A book of musings and stories of the early years on the starkly beautiful island of Hydra, Greece in the 50s and 60s where creativity flowed like wine and wine flowed like well…wine. Above my Greek Vegan Gyro tastes best n the garden. Yes my piece is in there too but I am the least of the voices. Mine is a child’s remembering of paradise. The other voices speak of the same time the same place yet some flow dark like red wine across the page, some shock like bitter lemons, some lie quietly like sea glass on the shore, some like the froth on bitter greek coffee. The effect when you are finished with this book is like sunlight shining through dark panes of glass. Suddenly there is blue and green and amber and all those panes illuminate a tableau in stained glass. 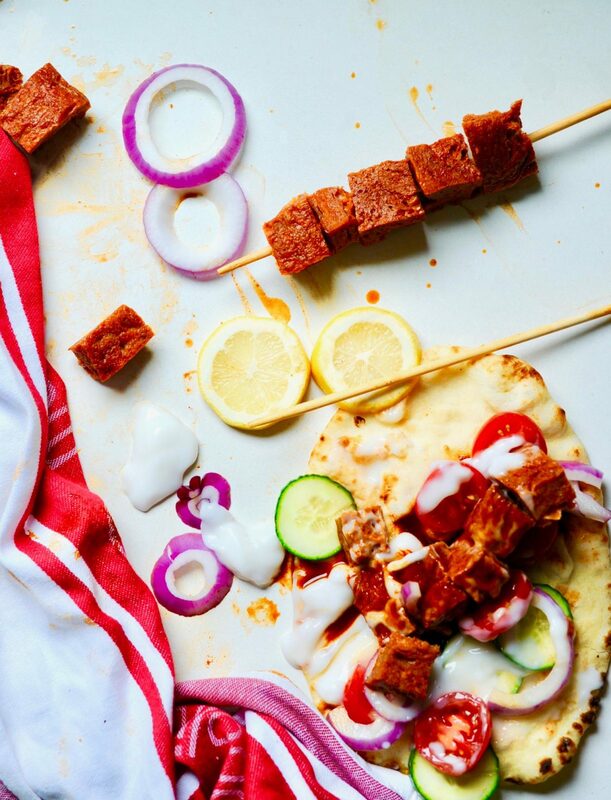 Make this Seitan Souvlaki and Tzatziki recipe and continue on with making your Greek Vegan Gyro. This layered greek-inspired wrap ticks all of the boxes. 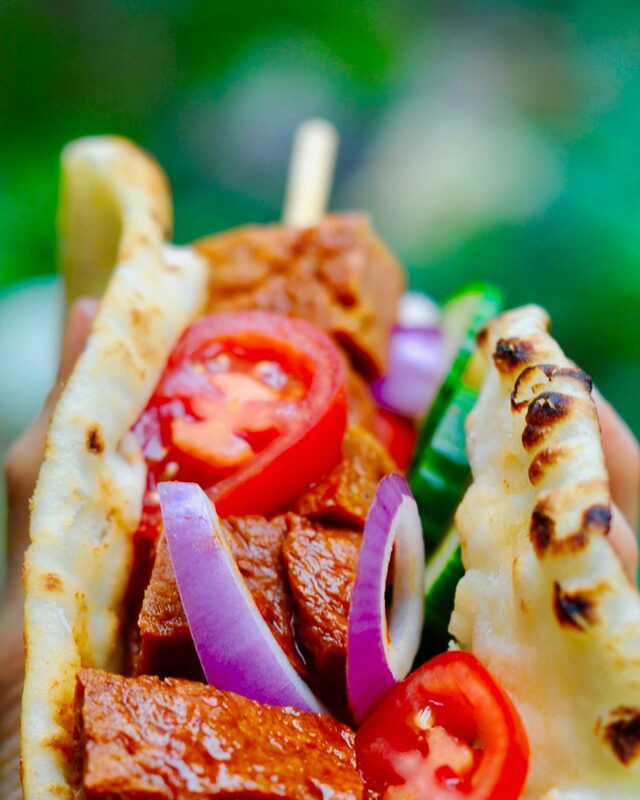 Savory charred seitan, cool garlicky cucumber sauce, pungent onion, ripe tomatoes and crisp lettuce all wrapped in a neat portable flat bread. 4 flat breads, I used pre-made Naan bur pita or really any soft yeasted flat bread works great. I think that tortillas would make a delicious substitute in a pinch! Slice your cucumbers, onions and tomatoes. Wash and dry your lettuce. Give your flat bread a quick warm in a hot cast iron pan. Assemble your gyro. 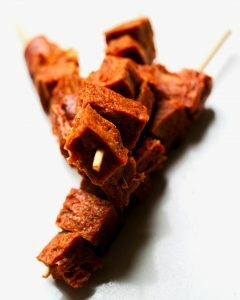 Remove your seitan cubes from the skewers and slice into halves or thirds. Now layer of your veggies and drizzle with Tzadziki. I wouldn't make this in advance cause it will get soggy. Your contribution to When We Were Almost Young is as poignantly lyrical as your Sunnyside posts. 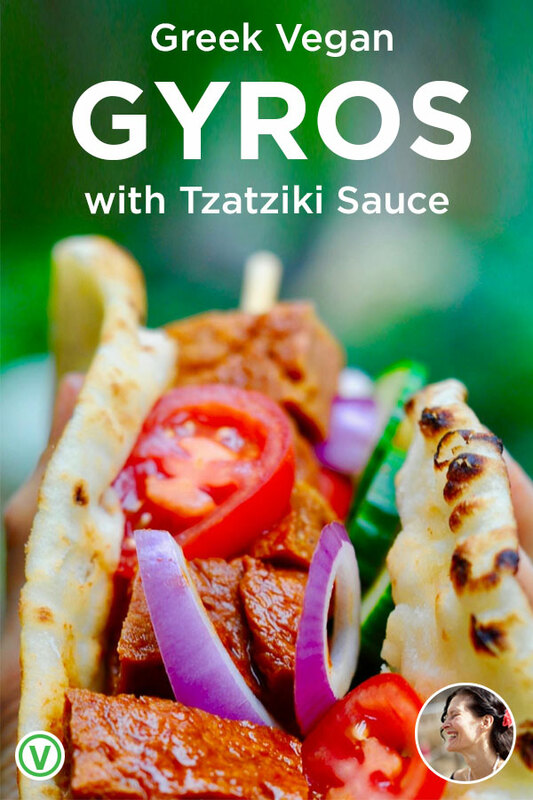 Your essay is like the tzatziki sauce of the anthology gyro. 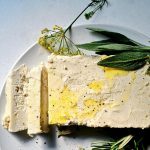 And thank you for veganizing these classic Greek recipes! Thank you for your kindness. Your contribution is one of the greatest gifts I have received and I believe our children and children’s children will read our dog eared copies aloud to each other in wonder at our non-conformist childhoods.